Members, help us reach our 100% goal ASAP and renew your membership now. Welcome to Pewaukee American Legion Post 71! Thank you for taking the time to visit the website for the American Legion Post 71, in Pewaukee. We are an organization dedicated to serving veterans, their families, and their communities. Pewaukee Post 71 was constructed in 1929 and was the first building in the country to be built as an American Legion clubhouse. The bar was added in 1949. Our Veterans of All Wars Memorial (left) was dedicated on May 25th, 2013 and again re-dedicated on May 29th, 2016. Our post consists of the American Legion, American Legion Auxiliary, and Sons of the American Legion. We currently do not have a Legion Riders affiliate club at our post. The American Legion was chartered by Congress in 1919 as a Patriotic veterans organization. For information on becoming a Legion member, please feel free to send an email to pewaukeepost71@gmail.com. 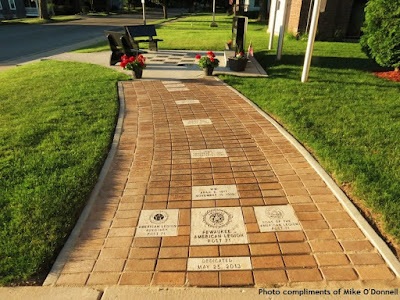 A memorial dedicated to all Veterans of All Wars was dedicated on May 25, 2013. This Memorial was rededicated on May 28, 2016. You can find additional photo's here. Included as part of the memorial, is our memorial sidewalk. If you are interested in purchasing a brick in the memorial sidewalk for yourself or someone else, please complete and submit the Memorial Brick form. Please contact Rollie Crandall or Fred Galante to see if there is space available for the war for which you wish to purchase a brick. If you purchased a memorial brick and have yet to receive your brick memorial certificate, please contact us. Note: We have been unable to deliver brick certificates for the following individuals. If you know who should receive the certificate for any of any of these individuals, please let Rollie Crandall or Fred Galante know.